There is nothing I like better than to wander abroad from my salon, taking in the sights and sounds of the world around me. From the bustle of our great cities to the rolling hills of the countryside, I like to take m inspiration from the most unusual paces and today's tale is of a poem that owes its own inspiration to the city of London. William Wordsworth left London with his sister, Dorothy, in the early morning on 31st July 1802 on their way to travel to Calais. 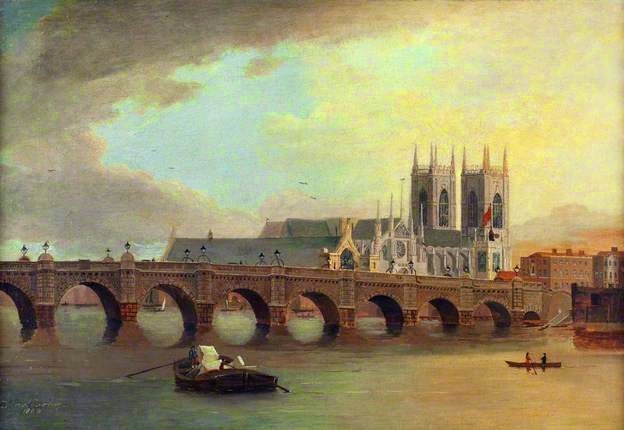 Wordsworth was struck by the simple beauty of the cityscape and later composed a sonnet entitled, Composed upon Westminster Bridge, September 3, 1802. The sonnet is a love letter to London in its waking hours, blanketed by the morning sunlight and an all-enveloping silence. Here in the heart of the city he experiences a deep peace that touches his should and fires his inspiration, finding in this man made environment a perfection to rival nature itself. For one so closely associated with poetry of nature, it is a surprise to read such rhapsodical lines addressed to the capital but reading the sonnet one can share in those early morning moments, the Georgian city yet to wake from its slumber. Oh, yes, I forgot about this! Today is my birthday and trying to compose a birthday meme when so many of the other events of this day are battles and invasions and disasters is not easy, so this is welcome. Thank you. Lovely. Hadn't read that poem in years. It's just a gorgeous poem, I love it. I love that poem, Catherine. What a glorious sonnet. Many thanks, Catherine. Wordsworth's sonnet induces the same feeling of beauty and calm in the reader. Dorothy's diary for that date makes interesting reading. Although the poetry is William's it seems to reflect many of her initial reactions to the experience of crossing the bridge.